She already had three children then when she flew and traveled back and forth. It was the same reason that she resigned from work. She needed to look after her three growing boys. Not long after, an opportunity knocked her way that she couldn’t resist. The company she was working for as a freelance writer offered a fulltime position as an Accounts Manager. She handled brands and made marketing plans to further promote both the company’s services and products. And two of the accounts she handled were an aviation firm and a bus company. Again, she travelled around and even outside the country. She enjoyed her post so much she stayed with that PR firm for five years until she had a miscarriage. God must have been too merciful she got pregnant again, and that time, she heeded the advice of her heart and her husband. She resigned from her post. Now, this mother is happily staying at home being a homemaker and a full-time mom. She is often left at home with her two-year-old son and her three-month old baby. More than caring for her two little ones, she loves it best when she would pass by their refrigerator. She would intently look at each little souvenir item – all reminding her she was able to set foot in that piece of the earth. But as her infant would only cry for food and wet diaper, her toddler can be real playful and imaginative. He would try to play with almost anything, his mom’s ref magnets weren’t spared as well. This mom felt sad. Her beautiful collection of fridge magnets are slowly diminishing. Some, all battered beyond recognition. But more than the chip from the edges of those ref magnets, it’s the thought of not returning to the same places and buying once again her favorite souvenir items that sadden her the most. What perhaps draws her to love refrigerator magnets are their affordability and cuteness. Apart from making great decorative souvenirs, fridge magnets are also fun knick knacks to collect. 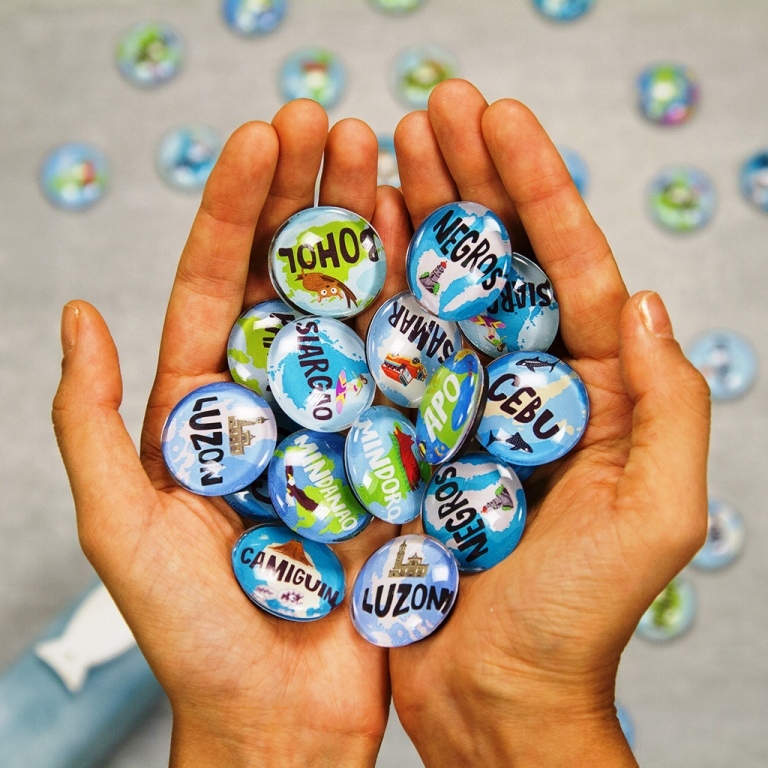 More than their strong appeal, each ref magnet brings beautiful memories and the determination to plan that next trip. Those fridge magnets give me the luxury to dream and look forward to my next adventure. Perhaps my love for traveling started when I first fell in love with the Philippines. It may be the same love a Russian named Jane felt for our country. She decided to stay here and soon after opened a business in Dumaguete City, Negros Island in the beginning of 2017. And her business? She loves to share her passion for the Philippines that she works closely with local artists for the production of some of the country’s souvenir items. Among she offers are postcards, kitchen posters, and ref magnets – all devoted to the beautiful Philippines! Her online souvenir shop, inspiredby.ph, also offers memo pads and notebooks. Aside from their beautiful design and quality, these pads and notebooks are a perfect companion to journal those trips. They may also be given as a souvenir gift to friends and loved ones. And one of the things I first noticed about the souvenir items they offer are its happy, fun, and colorful designs. Perhaps it helps that our Russian beauty was a former graphic designer for toys. I have come to know Jane from social media when one night, out of my frustration, I searched for fridge magnets. One post came after another that led me to inspiredby.ph. Just like others who visit their online store, I easily fell in love with their fridge magnets. They offer teardrop shaped refrigerator magnets as well as other souvenir items that would make one curious about the Philippines. The same curiosity I had on who are the brains behind the online shop. Because only those who show love for their country would be so proud of their heritage and strive to promote it. My discovery led me to all the more admire Jane. She isn’t a native of the Philippines. Yet, her deep love for our country is what made her stay in the Philippines, open a business, and trust the local artists to help her grow her market. Maybe she found her quiet escapes away from the hustle and bustle of city living on the beaches of Palawan, Boracay, and El Nido. Or perhaps, she got totally in awe with the cute Tarsiers of Bohol and the valiant Philippine Eagle of Davao. Whatever her reason for staying here, I would want to thank Jane for the amazing dedication she pours to her business and the love she gives to this country. What she gives isn’t a forced friendliness but a sincere generosity to promote a nation she immediately felt at home. And her love for this country is evidently seen as one unboxes each package from inspiredby.ph. I have travelled quite a lot in and outside the Philippines. For me, a place is defined by it nature and its people. By that standard, I may say the Philippines is a paradise on earth and is made even lovelier with individuals like Jane who has come from a different nation but treats and respects the Philippines as her own. Check her beautifully crafted souvenirs inspired by the Philippines. Surely, you will be inspired to travel your own country and be proud of the Philippines. I used to buy ref magnets too when we travel but I stopped my collection when I had my son. Nabasag niya yung mga ref magnets ko kakaplay sa ref. lol. Now, pag super like ko na lang yung magnet saka ko bumibili. Same here, thus I really searched for shops offering ref magnets. Then I often remind my boy to “do not touch. look only.” He seems to understand naman, He will get a piece then show to me then return it. I should have taught it before. Our ref is also full of magnets, but they’re from my jet setting Mom. Jane looks like Jennylyn Mercado, IMHO 😉 I’m currently checking her page to check out places my family & I would love to go to! These are really lovely! I’ve only been to a few places here in the PH and never been outside the country. These souvenirs are cute and artistic. Reminds me of Dane and how patriotic he is, he supports many Filipino athletes at sumusubabay ba sa mga international competitions involving PH. Aww… I really love their products. Sayang di ako naka-attend last week andito sila Jane. I am indeed inspired on how they love our country, sobrang nakakatuwa. Sobrang nakakatuwa na talagang foreigner sya and yet she loves the Philippines like her own. I wasnt aware about the event. Sayang. hahaha! just came home from Baguio with a ton of fridge magnets from the place. they make the cutest, don’t they? How wonderful that someone who isn’t from here would love our country even more than our own people? You will travel again, Berlin. With your kids. 🙂 And they will love doing it with you. Saw your Baguio pictures. Ang saya saya tignan. It is inspiring to see your kids can really joke and pose around with their parents. Yung mga boys namin medyo shy na sila. Yes, the ref magnets are so beautiful to look at. And the story of the owner is really inspiring. I collect ref magnets too! 🙂 It’s quite pricey lang compared if you collect key chains, but the ref magnets looks nicer kasi /.